Rheumatoid arthritis mechanism. 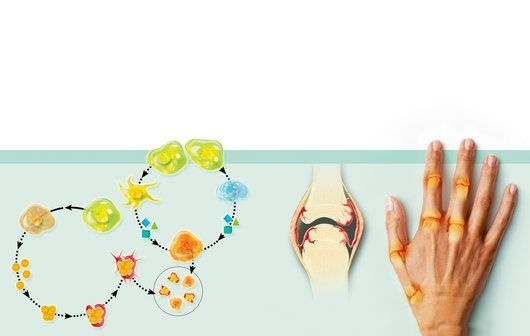 Artwork showing various aspects of rheumatoid arthritis, the inflammation of the joints due to attack by the body’s own immune system. At left, two sets of cellular mechanisms are shown, including B-cells (green), a plasma cell (brown), a macrophage (green, with protrusions), an osteoclast (orange) and a T-cell (blue), as well as various proteins and antibodies involved in the process. The cutaway artwork to the left of the hand shows the anatomy of a single knuckle joint, including the synovial membrane (red). The hand (far right) has the bone and joint anatomy superimposed on it, and shows swelling around the knuckles caused by the cellular processes outlined at left.